It’s the middle of July, although you wouldn’t know it by the weather, and its Open week. This is probably the second best known week in the golfing calendar as far as television viewership is concerned. It’s a toss up between this week and the Masters as to which is bigger with regard to viewers. For me the Open is the number one event. It is played on a links course which I grew up playing. I am in Carnoustie for the Open, which is a course that I know very well as I played in the last Open here and also it is one of the courses on the Dunhill rotation. It is great coming to a course that I know well. It certainly suits the Europeans, as anyone that plays in the Dunhill regularly will be very comfortable playing here. This course has the reputation of being the toughest on the British Open rota; having played here in ’99 I would certainly agree with that. This course is exceptionally tough as nearly every tee shot you are under pressure. All the holes are well bunkered from the tee and you know that if you hit it in any of them, it is a dropped shot. This course has the reputation of being the toughest on the British Open rota; having played here in ’99 I would certainly agree with that. I am coming into this year’s Open after playing two events in a row. In the last few years I have had a week off coming in, but last weeks event was a great warm up for me as it got me four competitive rounds of links golf. It has certainly been a big help as it got me into the right frame of mind before I came here. Links golf is so different to what we play normally, as the wind makes much more difference and the shots that you take on are totally different. I arrived in Carnoustie on Sunday evening; I find it easier to arrive earlier as it means that you have plenty of time to get everything done. Monday was a very relaxing day for me. I decided against playing the course as the weather was bad in the morning and I was still quite tired from the weekend. I spent a bit of time practicing my short game, mainly my chipping and bunker play. I got some treatment on my neck and other ailments in the afternoon and then headed back to my house. I played the course on Tuesday for the first time this week; I have to say it was in great shape and playing very well. It is extremely fair, nothing like the way it was set up in 1999. There is plenty of rough on the course but it is manageable. There are some areas that are pretty heavy but on the whole you feel that you can hit a shot out of it. Also because there has been so much rain over the last few weeks the greens are much more receptive than they would normally be on a links. I spent a bit of time on the course practicing my punch shots and chip and runs, the shots that we don’t hit all that often in a regular tournament. After playing last week they were much better, as it definitely takes a while to get back into hitting 5 irons from 150 yards and three woods only going 230 yards. On Wednesday I played my last practise round before the off with Paul McGinley, which was good fun. It’s always good to play with Paul as it makes it a lot more enjoyable. Practice rounds are boring enough at the best of times so whenever there is a way of making them a bit more enjoyable it’s worth doing. As well as that it helps seeing how someone else plays the course, seeing what clubs they hit and how their ball reacts. I struggled with my game a bit on Wednesday; I was losing a few of my shots to the right. It felt like I was coming out of them a little, whilst they felt like they were miss hit. It’s never great getting a feeling like this the night before a major, so after I played I went straight to the range to try and sort out what I was doing. I hit balls for about an hour to try and get rid of the feeling and by the end of the hour it was beginning to feel better but still not quite what I would like. However the Open is starting in the morning and so I didn’t want to get into any heavy technical stuff. I have learnt over the years that things can feel bad on a Wednesday and by Thursday morning they are back to normal. I know one thing, I would be happy to be standing on the 18th tee needing a par to win! Here’s hoping! Carnoustie is a fantastic course. The last time the Open was held here it got a bad name as it was set up very tough. I think that they reason they set it up so tough the last time was because they hadn’t held an Open for so long that they were worried that it might play easy. With this in mind they set it up very tough and then they got some bad weather to add to it and as result a lot of players felt that it was brutal. This time around they have the course set up very fair. The tournament committee are well aware that they have a great course that is well capable of holding its own. As with all the majors the committee really know what they are doing as regards the course, as they can set it up for whatever winning score they want. This course has 18 great holes, holes that can bite you at any stage. There are some holes that you feel you have a good chance to make a birdie on but then as soon as you try to force something on them you find yourself making a bogey or worse. No matter what you say about this course the holes that will be remembered most are the last two holes, two par fours. They are both played over the famous burn. The 17th is 461 yards long and you have to go over the burn twice. From the tee you hit it between the first and second part of the burn, from the landing area and you are left with shot of about 200 yards into a green that is surrounded by gorse. This is a treacherous hole; anytime you make a par on this hole you are very happy. After this tough hole you then head to an even tougher par four, which measures 499 yards and again you have to hit over the burn twice. It is 208 yards to the fairway and the burn snakes around the fairway. There are fairway bunkers on the right of the fairway starting at 300 yards; all down the left is out of bounds. This is probably the hardest finishing hole in golf! Everyone can remember the last Open here when Jean Van DeVelde was leading playing the last. If ever there was a hole that no lead is safe on this is it. I remember in the last Open I hit a three iron into this hole on the Sunday; it pitched on the green and ended up running out of bounds. It was a good shot too! I am looking forward to getting started this week; this is a tournament that I would dearly like to win. I feel that I have come into this week having prepared very well. Last weeks tournament was a great warm up for me and the work that I have done this week has added to it. I was asked in my press conference if I knew that I was considered the fourth favourite by the bookies. I didn’t know this and I also said that I didn’t really think that it was a good price or value for money. As ever I am trying to stick to my game plan and play my own game. I know that by doing my own thing I well capable of performing well, and if I can get myself into contention come Sunday afternoon then I will be happy to take my chances from there. I know one thing, I would be happy to be standing on the 18th tee needing a par to win! Here’s hoping! I am writing this as the Open Champion which is still hard to believe even after a few days. This is the first time since I won that I have had a few minutes to sit down and go through last week. No matter how much I believe that I would win a major, now that I have it is still a huge surprise to me. I still had an element of doubt about the fact that I would win one, but the people around me were definitely more confident that I would win one than I was. Ever since I started playing golf I have watched the Open on television and dreamed of having a putt to win it, little did I know how nerve wracking it would be when I eventually had the putt to win. From day one I got myself into a solid position. I opened up with a two under par 69, which was a round that could so easily have been a good bit better and also could have as easily been worse. So all in all I was happy to post a two under round, it was a solid start. There weren’t too many dramatic moments in the round; it was a solid enough round. I suppose that the most dramatic moment was my bunker shot on the second, after I had hit it in the greenside trap on the left. It had run right up the face and on the left hand side. Where it finished I had no way of getting to it normally so I had to hit it left handed. Luckily I managed to hit it hard enough that when it hit the face of the bunker it got over and onto the green from where I two putted for a good bogey. I was happy with my start as it was a good enough round to put me in the tournament. I knew that I had a lot to do over the rest of the week but I also knew that I hadn’t blown myself out of it. Friday was a different day, the conditions weren’t as good, it wasn’t too windy but it was cold. I played early in the morning and I struggled with my game. I was struggling with a hook all day, which was a change from the practice days as in practice I couldn’t hit a hook; I just kept hitting it right. I was hooking most of my clubs but the worst offender was my driver, I had put a driver in play on Thursday that I had used two years ago, every time I pulled it out I felt that I was going to hit it left. My round was very much one of trying hard to stay in the tournament and not blow myself out of it, it really came down to my short game. I spent the afternoon on the range trying to sort out my hook and also getting used to a new driver. I had to make several up and downs throughout the round. On the eighth I pulled my tee shot left of the green and dangerously close to the out of bounds, the pin was tight to the left over the trap which meant that I had no green to work with. Luckily I have been spending a lot of time practicing my flop shots lately and as a result the shot didn’t look too bad to me. I played it well and put it to a foot for a simple four. On the ninth I had to “up and down” it from the left trap, again the pin was in the left side of the green and so I had little green to work with. A bad tee shot on the tenth cost me a dropped shot and after nearly driving the eleventh I only managed to walk off with a par. On twelve and thirteen I had to make good up and downs to save pars again. On fourteen I hooked another tee shot, this time into a bunker, I had to lay it up and left myself an eight iron which I hit to 10 feet and managed to hole to get myself back to level par for the day It was hard to believe that I was level for the day as it seemed like I was all over the place. On the 15th I caught a fairway trap which led to another bogey. When I was standing on the 18th tee I was two under for the tournament which was a fair achievement considering the way I had played. I pushed my drive right of the burn, to where Van De Velde did in 1999, but it was fine. I wasn’t able to go for the green so I laid it up and then pitched on to 20 feet. However I had a run at the first putt and knocked it four feet by and then ended up missing the one coming back which left me on level par for the tournament and very deflated. I spent the afternoon on the range trying to sort out my hook and also getting used to a new driver. Luckily Wilson were there for the week and they made me up a lovely new 8.5 degree Dd 6 + . I really liked the new driver and was hitting it great on the range. By the end of a couple of hours I had managed to get rid of the hook as well. Heading out for my third round I was six behind Sergio. I knew that I had to play well and shoot a good score to give myself a chance of wining come Sunday. I played very nicely on Saturday, started with a birdie and gave myself plenty more chances during the round. I made four birdies and one bogey, my bogey coming on the 12th. I had played very well all day and definitely should have been a few shots better as I had hit some great putts that just didn’t go in. When I reached the 18th I was three under for the day and, as I had every day, I hit driver. It was my new driver and I was hitting it very well, and I did the same down the last. I came up just short of the last bunker which was 314 yards to reach. When I got to the ball I realized that it was the same spot that I had hit it out of bounds from when I played in the British Amateur here 12 years ago. This time I was hitting an eight iron as opposed to a six iron but I hit a very similar shot, which was heading straight out of bounds but somehow it landed softly and left me able to use me putter and make a par. It was a huge break for it not to go out of bounds as normally anything going left is O.B. I finished the day on three under and the same for the tournament. However Sergio played well also and had shot 68 as well. It meant that I was six behind heading into the final round, as was Paul McGinley. I would play in the third last group with Stewart Cink and Paul would play in the second last group with Chris DiMarco. We were both in with a good shout but we needed to play well. Sunday of a major is always a different sort of day than normal, especially when you are in one of the last few groups. I got to the range a few minutes earlier than normal as I knew that there would be a few interviews to do. I did everything as I would normally do in my warm up and headed out. I started with two pars and then I pitched it stiff on the third for my first birdie. On the fifth I made a good up and down from just off the edge for par. I birdied the sixth after a good pitch from an awkward position and then a six iron approach to five feet on the ninth gave me my third birdie of the day. I was out in three under and six under for the tournament. The tenth was probably my fist bad shot of the day, after I lost my focus over my second shot and totally duffed my approach. Luckily it made it to the front of the green and from here I ran my putt eight feet by, which was a crucial putt to hole as it kept my momentum going; it was a good par in the end. An eight iron approach to two feet on the 11th got me to seven under and then two pars on the 12th (I don’t know how my putt stayed out) and 13th had me at seven under standing on the 14th tee. Ronan and I had discussed a couple of holes on Saturday night, mainly the 14th and 18th; these were two holes that my strategy could change on depending on how I was doing. On the fourteenth I felt that if I was chasing I could hit three wood or driver over the bunkers and try and leave a shorter club to the green. The 18th, what can I say about this hole; it is probably the toughest finishing hole in golf. So when I stood on the tee box I suggested three wood but Ronan suggest that I lay up off the bunker on the right with my five wood, I don’t look at leaderboards so when Ronan suggested that I lay it up I knew that I was in the tournament. I hit five wood and came up two yards short of the bunker and then I hit a four iron a little left but got a good bounce and it set up my eagle. This put me nine under which I remained until I got to the 18th. The 18th, what can I say about this hole; it is probably the toughest finishing hole in golf. I had decided earlier in the week that if I was standing here with a one shot lead that I would play the hole as I would normally and try and win. This is what I did but I pushed my drive into the burn, which was a shock to me as I had been driving it so well. However I knew that it wasn’t over and that it was still possible to make a par. However another bad shot put me in the burn for the second time. It all seemed to be going wrong! Again I took my time and made sure to regain my composure and to try and get it up and down, which I did. From 49 yards I hit it to 4 feet and then I rolled in my four footer for probably the best double bogey of my life! This left me watching Sergio’s last hole on the television, with the sound turned down. I felt a bit deflated but I was making sure not to get down on myself as I knew that it was still possible that I would have a second chance. When he hit his par putt I thought that he had holed it but then it just straightened and with that I had got my second chance. I went to the putting green to warm up and had a bit of a chat with my house guest, Bob Rotella. I was in a good frame of mind going out as it felt like I had been given a reprieve. The first hole of the play-off set up my win as I made birdie and Sergio made a bogey. We both parred the 16th and 17th so that when I stood on the 18th for the second time I had a two shot lead. This time I felt that I could lay it up and play it as a par five. I hit my hybrid from the tee, then seven iron to leave me 103 yards. Sergio hit a good second shot from the left rough to get it on the green. I pulled my sandwedge to the left edge of the green and then rolled it 3 feet by. When Sergio missed it meant that I had a three footer to win the Open. It seemed like six feet and it was a right to left putt, the ones I don’t like. 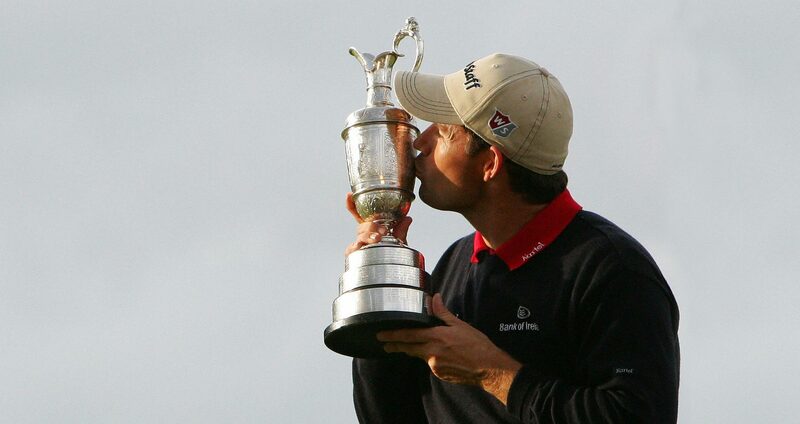 However, I holed it and I am now the Open Champion of 2007 forever more. It feels great to say it. Since the putt went in I have been on cloud nine, it has been one big party and I don’t want it to stop. I celebrated with my family and friends in Carnoustie on Sunday night and then I had a bigger party in the Sporting Emporium in Dublin on Monday night. It has all been great and very hectic, and on Thursday I met with the Bertie Ahern. The letters and calls from all the well wishers has been great. I intend to celebrate like it won’t happen again but I definitely want to win more. I have a few more days at home to enjoy it before I head off to the States for the build up to the PGA. I am not sure what to expect when I get back to tournament golf next week in Akron for the WGC Bridgestone event, but whatever it is like nobody can take away the fact that I am Open Champion. Thanks to everyone for all their support and well wishes over the years!